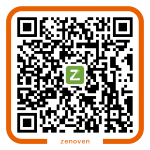 zAlive is a responsive two columns theme with green and black color. With rich options you can custom the slider, excerpt, advertisement code,primary sidebar layout, copyright, nav menu, CSS style, scripts and more. * rewrite top nav bar with better performance and friendly interaction(on mobile device). * first level menu item with sub menu in top nav now is clickable. * add French translation(thanks to Geek01). * fix the bug that slider and secondary-sidebar showing on blog post page(not homepage) even the setting is ‘Enable in Home Page’. * add ‘Read More’ link for custom excerpt by modifying functions and filters. * optimize mobile platform CSS styles. * add option for changing slider pause time. * fix slider content can’t be empty bug. * optimize pagination style in mobile platform and the case that there are many links. * fix dropdown menu height bug in IE 10 and 11. * optimize pagination CSS style. * make the option ‘Text for “Read More”‘ in effect when ‘more’ tag is used in posts. 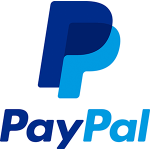 * fix the arguments of wp_list_pages in footer.php(thanks to navillus0). * add more social media links to the Social Links widget. * replace GMT time with local time in custom recent comments widget. * optimize the icon position in sticky post title( in case there are more than one line of text in title). * add Russian translation(thanks to Aleksey Maksimov). * fix some translation bugs. * optimize some textarea style in theme options page. * optimize the style of post content. * optimize the style.css with better selectors, coding style and well comments. * add style for pages like: password protected page, 404.php, content-none.php and more. * add many theme options like: excerpt,primary sidebar layout, swithes(tagline,searchbox,breadcrumb and more), CSS code,scripts. * add support for custom background. * add zAlive.pot in /languages and may be useful for translator. * rewrite custom widgets with better security. * providing better content pagination and comment pagination by using new functions or arguments. * replace footer widgets with secondary sidebar so that you can custom it with widgets you want. * add filter for wp_title. * change arguments in wp_list_categories and wp_list_pages to hide unnecessary levels of menu. * add some default widgets incase sidebar is left as blank. * replace title.php with usage of wp_title. * fix sub-menu dropdown bugs on mobile platform. * fix sub-menu not showing on hover event. * update twitter-bootstrap-hover-dropdown plugin with a new version. * optimize the format of date before the post(according to the user-selected date format rather than hard-coded). * escape all home_url() calls. * use jQuery that WordPress bundled rather than a theme customed one. * optimize the default value in theme option page. * fix double title bugs. * change license from GPL v2 to GPL v3. * remove translation for theme options default value. * better security and more effective for set/get theme options. * some translation bugs fixed. * enqueue all stylesheets and scripts by using wp_enqueue_style() and wp_enqueue_script() in theme option page. * replace hard coded credit link with esc_url function. * replace 4 slider images with more beautiful ones. * optimize styles for ‘code’ markup. * add styles for ‘code’ markup. * balance the height of #main and #sidebar with CSS rather than JS. 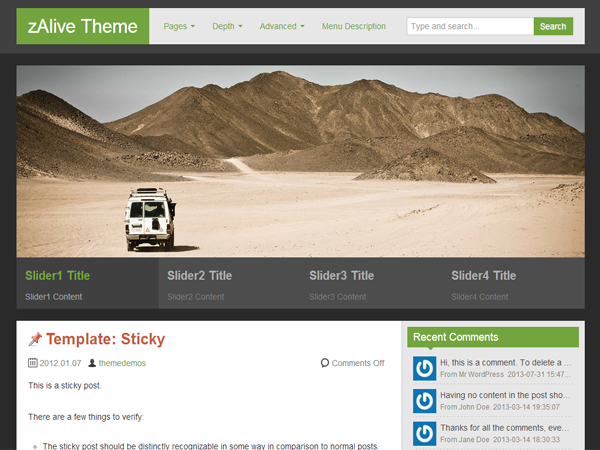 * add header-no-sidebar.php so that we can use it in other template. * add page-no-sidebar.php so that we can post a page by selecting ‘No Sidebar’ page template. * remove one credit link in the footer. This is a great theme and I like it very much! But now I have a problem when loading images in slider. i like your theme too much. i want to know if i change whole header then what code or how should i do? Hi, I’m Kevin, the founder of wpnode.net, to help people with WordPress by providing free WordPress hosting. We really appreciate if you could check our project. Is it possible to host a English official site for your theme zAlive? If you are interested, please send us an email to hi@wpnode.net. Thanks! I would like to add social menu, only Facebook in the nav. How can I do it? In present case, the design doesn’t seem to take image in CSS background. And add a link in the menu with the CSS class – nav-social-facebook. hello: I have already submitted comment about the offline writer, the image adjustment no more work in Windows live writer if downloading your theme, any idea ? thanks! 2. 如何把secondary sidebar設在page下面,有些page我想有primary sidebar,有些page是secondary sidebar widget..
Hi! Really nice job you did with this template! Congrats! I was wondering if is possible to set up the number of images in the slider. Is it? just create a text widget and copy your code there, doesn’t it work ? Thanks for your great theme zalive. I so liked Zalive theme, and I used this theme in my another project. If I want to remove the pages in the comment boxes, I can do that? In vain I take off the tags appear in the comment boxes! (Worpress version 3.7.1) Sorry for the clumsy English text that! I thank you for your help! The animation is implemented by bootstrap carousel plugin and I haven’t find a solution to turn it off so far. I removed animation from Zslider or change animation type. How can I do? Can i get English Support for this theme? i like it very much… need English support for setup. Setup is easy, any questions ? And on the footer part. But I can only set 1 menu for nav menu and for footer? How to add more? you can put many links in one menu just as my stie, isn’t that enough ? Thanks. Finally got it. Sorry just newbie on wp blogging. But what i wanted to ask is if there is a way to deactivate the responsivness of the theme. That is a built-in feature and most of it is done by CSS media queries. Thanks for your great theme zalive. Could you please check these pages, I removed “Theme zAlive by zenoven” text, but I added infomation in About page. Please check them and if you find that is violation, or you feel unhappy about that, please let me know. P/S: which plugin you used to make rating function above? It’s OK. But it’s recommended to create a child theme rather than modifying the original theme files because each time zAlive is updated, you’ll lost your modification. That plugin is GD Star Rating. Thanks zenoven. I created child theme. Thanks for your support. If we create a child theme, can we modify or change the colors on the style sheet too? I want to use light blue instead of green, is it okay? I ma using this theme and i realy like it keep up the food work guys. And how can we setup comment. Thank you very much for awesome template. How can we change the delay time of slider? wow! really sleek and fast loading theme, thanks for creating and sharing it with us. Second – if I have a subpage, I can not click on the parent page in the menu to navigate to it. For example, parent/main page titled “ABOUT” has sub-page “Upcoming Events”. If I click on “ABOUT” it just drops-down the menu with sub-page rather than taking me to the ABOUT page. I can click on “Upcoming Events”. If a main page is listed in the menu with no sub-page, then I am able to click on it in the menu and go to it. How do I make it make the main page clickable when it has sub-pages associated with it? Hi Jill,Thanks for your reply, the first one is absolute a bug and I’m sorry for that, I will fix it soon. And to the second,I know that before and it’s caused by bootstrap dropdown menu plugin, I will think it over whether to continue using this plugin or implement the dropdown menu in another way. First date, very nice work man! Hi salanki , the excerpt is not supported in the live version unless you use the more tag in the post content , but don’t worry, I’m working on a new version which has many new features and bug fixed. that’s great! Excerpts and footers need to be updated. That’s the main requirement for a good website. Otherwise this theme is really exceptional. In excerpts, there should be author name, date and comments count box. It’ll bring the best visual feeling to readers. New version almost finished except more tests and to be reviewed after uploading. Now the footer is renamed as secondary sidebar and you can use what widgets you want. Excerpts is also supported with theree options in which you can custom the excerpt length, custom ‘Read More’ text and a switch to enable it or not. And some of new features are done like custom primary sidebar layout(left,right,or none), header searchbox switch,tagline switch and custom CSS code,JS code.